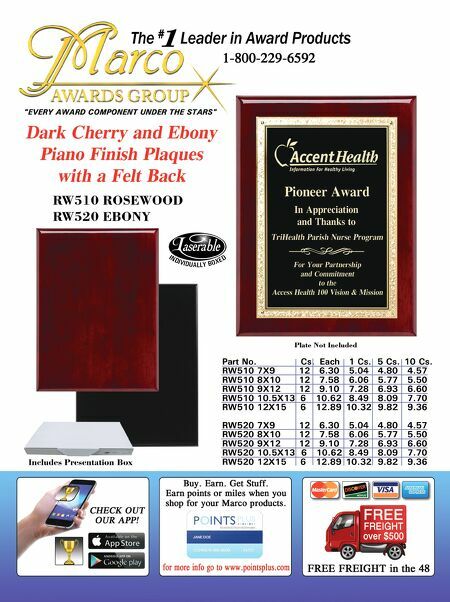 80 a-e-mag.com • A&E OCTOBER 2018 A&E PANEL OF EXPERTS BOB HAGEL and his wife Dana own Eagle's Mark Awards & Signs, offering a full line of personalized products using laser engraving, sand etching, and full- color UV direct print on products. They have offered awards, recog- nition, and signage products to organizations for more than a decade in the Southern Cali- fornia wine country. He can be reached at bob@eaglesmark.com. STEVE CAPPER along with his wife, Nora, and their daughters, Jami and Toni, owns and oper- ates A-1 Awards, Inc. in Indianapolis. He has been associated with the awards and recognition industry since 1958, and has given numerous seminars since 1979. RUTH DOBBINS has been in the glass business for over 40 years and offers experi- ence in all glass-etching techniques as well as in fused and cast glass. Ruth holds a Master's Degree in Art and was a partner in an art glass wholesale supply and studio company in Europe before joining forces with her late hus- band, Norm. You can reach Ruth by email at ruth@etchmaster.com, or by phone at 505-473-9203. CHERYL KUCHEK is the owner of Just my Imagination DeZigns Inc. and has been active in the personalization industry for over 10 years. Cheryl has a passion for the industry and a love for helping people; she was the first to start a Facebook group to do just that. Sublimation for Beginners and Beyond is a resource to help those first starting out and those who are advanced. Cheryl can be reached at cheryl@justmyimaginationdezigns.com. COLIN VANLINT is a Sublimation Spe- cialist that started with JDS Industries in 2015. Colin graduated with a Bachelor of Art with an emphasis on Multimedia Design from Northern State University in 2014 where he learned graphic design skills. While attending college, he worked as a computer and printer tech- nician, acquiring years of troubleshooting and repair skills. Colin can be reached at colinv@jdsindustries.com. MICHAEL PERRELLI Marketing Manager, joined the Direct Color Systems team toward the end of 2013. In addition to man- aging the development and implementation of lead generation programs, Michael is responsible for managing all of DCS's marketing activities, communications, and strategies. Michael earned his Bachelor of Science degree in Marketing from the Univer- sity of Rhode Island. Michael can be reached at michael.perrelli@directcolorsystems.com. ADVICE AND QUICK TIPS Short on time? You can still get good advice! 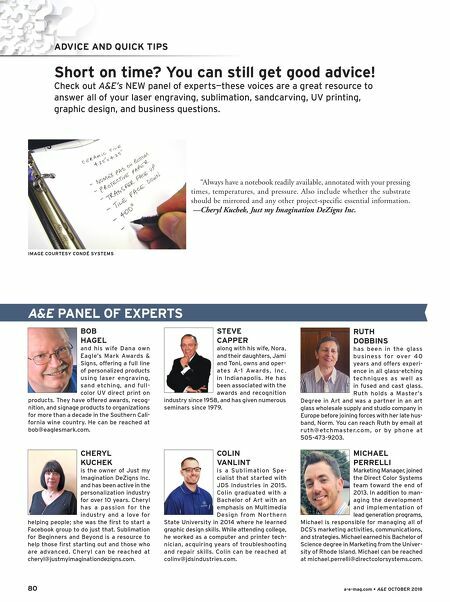 Check out A&E's NEW panel of experts—these voices are a great resource to answer all of your laser engraving, sublimation, sandcarving, UV printing, graphic design, and business questions. IMAGE COURTESY CONDÉ SYSTEMS "Always have a notebook readily available, annotated with your pressing times, temperatures, and pressure. Also include whether the substrate should be mirrored and any other project-specific essential information. —Cheryl Kuchek, Just my Imagination DeZigns Inc.